We dined at Italian Village for lunch to tour the facility towards planning future events there. 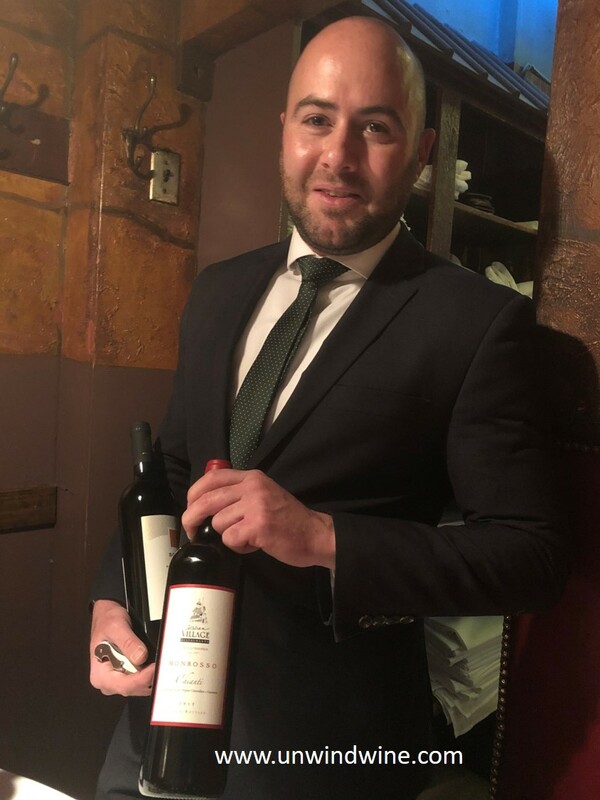 To pair with our lunch selections, Wine Director Jared Gelband selected this Italian Bolgheri Superiore Bordeaux Blend. Jared knows I favor Bordeaux varietals and big full bodied fruit forward complex blends. Wow! He pegged it with this selection. Who would think you would find this style in an Italian wine? From the Allegrini brand known for Amarone comes this classic Bordeaux blend from the Bolgheri region - Cabernet Sauvignon (65%), Merlot (25%) and Cabernet Franc (10%). I would've failed identifying this as an Italian wine opting for a California Cabernet with its rich full bodied rich ripe sweet fruit. It presented a residual sweetness almost extreme for a Bordeaux blend but much to my liking. This profile would probably be too much for most, especially Bordeaux enthusiasts, but I found it wonderfully delicious and perfectly matched to the brown sauce of my Veal Marsala. Winemaker's notes: "Intense ruby red in colour, the nose opens with nuances of cherry and plum and deep notes of black berries, followed by aromatic herbs and a pleasant spiciness. It is elegant and seductive on the palate, revealing considerable body, great structure and balance, and silky tannins." I give this 93 points, primarily due to my preference to this style and profile. 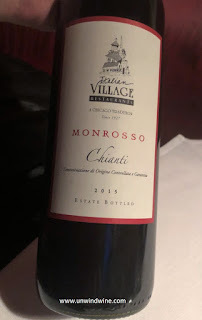 While we were there, Jared unveiled the new, soon to be released Italian Village Private Labeling of this classic Italian Chianti Monrosso a Sangiovese blend from Castello di Monsanto. This is the first such venture for Italian Village and was selected from one of the prime producers for American restaurants such as Italian Village during Jared's visit to the Estate last year. This special private labeling is a tribute in memoriam to second generation owner and patriarch to the legendary Chicago landmark restaurant, Franklin D. Capitanini 1932-2018.